I was so excited to have built my first Square Foot Garden based on my raised bed plans that I wanted to put it to use right away by trying to grow a winter vegetable garden. For the soil I went the easy route and purchased bags of Mel's Mix from Home Depot. It seemed pretty good. The soil is light and friable. Just handling the bag you can tell it's good because it's loose and not clumpy and solid feeling like other soil mix bags. It wasn't screened very well and I did see some small twigs and stems but it was better than some other organic potting mixes I've purchased in the past. From what I understand it's manufactured by different companies based on the region according to specs so quality may vary across the country. It wasn't too much more than buying individual components but saved me the work of mixing it myself. It took 6 bags to fill my 3' x 4' raised bed but it settled about an inch after a couple of weeks. Next spring I'll top it off with some of my own compost. I planted late, I've never done this before and I'm not quite sure what I'm doing yet so I don't have the highest expectations but it should be fun to try. Here's some info on how I'm protecting the plants from frost and what I planted. My original plan was to make a covered wagon style cover because I think it looks nicer but when buying my supplies I forgot to get an extra piece of 1/2" PVC tubing. I went with a simple frame by just using 2 10' lengths of 1/2" PVC that are inserted into opposite corner accessory holes on the lip around my raised bed. For the cover I went with with Sun Master Greenhouse Film from Growers Supply. I was planning to use a cheaper 6 mil poly sheeting that can be found in the paint section of big box stores but found out that it will start to deteriorate after about 3 months. The Sun Master Greenhouse Film is 6 mil thick, durable, allows more light and is UV resistant. It has a 4 year warranty and many reviews I've read indicate that it holds up well outdoors. It must be doing something because only a couple hours after installing it I noticed condensation forming on the inside of the cover. This indicates the temperature under the cover is warmer than the temperature outside. To secure the greenhouse plastic to the raised bed I purchased these Coleman Stainless Steel Tablecloth Clamps thinking they would be able to help keep the greenhouse covering in place and the stainless steel will hold up better outdoors. I'm not too sure about that now. The clamps may be good for temporarily holding down a table cloth in a stiff breeze but they don't seem very secure using them this way. Part of the reason I created the lip around the raised bed was for aesthetic reasons but it also serves other useful functions. One of which is to give me a place to place clamps to secure the cover. I think I'm going back to my original plan of using 6-Inch Steel Spring Clamps . They will be more secure and I can use a length of garden stake under the lip to help keep the plastic closed. I'm not sure if this covering is going to be enough. On some nights when it will get very cold I might throw a thicker cover over it. I have a bunch of furniture moving blankets that I can use. I went looking for different vegetables that can be grown well in the winter. Some root vegetables, lettuce and other greens seemed to be common choices. I also searched for seeds that had specified that they are cold hardy. I spaced some of the greens closer together than normal because I've read that they don't grow as big in the winter. We'll see. This is what I planted. I ordered all my seeds online from Burpee. I planted the spinach in September and the rest last week. The spinach has already started to sprout. 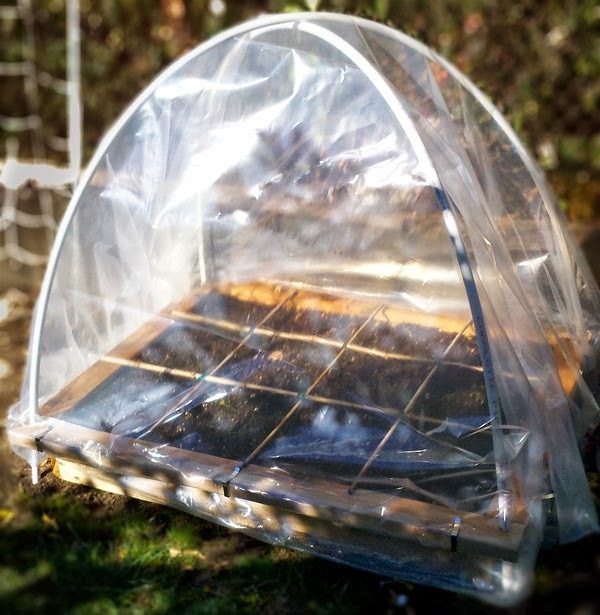 I'm worried about some of the other seeds because there seemed to be some digging in the soil after I seeded but before I received and installed the greenhouse cover. Here are the exact varieties of what I planted in my winter vegetable garden. Radishes, Pink Beauty. Radishes do well in the winter I think. I'll know in a few weeks since they are normally ready to harvest in 4 weeks. Kale, Red Russian. Kale is normally very cold tolerant but I'm worried that I didn't start it indoors and instead directly sowed it in the raised bed. We'll see how it turns out. Mustard Tatsoi Heirloom. Tatsoi does well in the winter. This is a large variety and 4 in a square I believe is too many for this variety but because of the colder weather I think it will be fine. Mustard Greens, Southern Giant Curled Heirloom. Again, this is a larger variety but I think 4 in a square will be okay. Green Onions, Tokyo Long White. To be honest, I don't remember why I got these as I don't see any indication that they're more cold hardy than other varieties. We'll see what happens. Carrots, Sweet Treat Hybrid. This seemed like a popular choice with good reviews. One of the main reasons I selected these is that they grow to 6" long which will fit in the depth of my 7-1/2" deep raised bed. Brocolli, Purple Sprouting Heirloom. Supposedly an extremely cold hardy variety. Normally harvests in 200 days over winter but I planted it a bit later than recommended. Onions, Sturon Organic. A medium, sweet yellow onion.These should be ready some time around March. Arugula, Organic. Normally thinned to 6" which would mean 4 per square foot but many prefer to plant 9-16 and harvest frequently for a milder flavor. I went with 16 per square foot for flavor and due to the cold growing temperatures. Spinach, Salad Fresh. I've planted this in the past. Grows well during the season and is great in salads. Lettuce, 4 Seasons Organic. Marketed as "remarkably cold hardy". Normally planted 4 per square foot but I went with 9 due to the cold. I wanted to plant more lettuce but also wanted to experiment with different seeds. I'll be harvesting frequently if it grows and the cold weather will keep them from growing to big I think. Radicchio, Variegated Chiogga. Spacing in the SFG for Radicchio varies between 1-4 per square foot. This variety is normally thinned to 12" which would mean 1 per square foot but I tried 2 for the winter to see what happens. I'll post updates if anything else grows. I'm a little concerned about some of the digging I saw but now that I have a cover pests shouldn't be a problem. At least not once I get the spring clamps. This is my first time doing this so if you have any advice please leave a comment below. Looks great. Do you know how the temperature this would protect the vegetables down to? 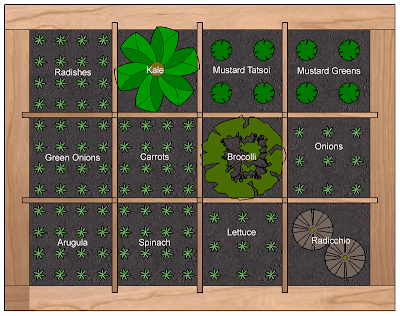 Square Foot garden looks interesting technique which also helps to save lots of space but it requires lots of necessary things which are mentioned in your post.I am going to implement this technique to create a winter vegetable garden which solves my passion for gardening.